What is the most important aspect of your Presentation? I ask this question at the beginning of every workshop I give on Presenting Powerfully. The answers are always varied. No one group ever agrees on what is the most important thing. However, I believe that the most important thing in every presentation is the audience, not you or your ideas. Why? Because a presenter is there to serve the audience, to help them solve a problem. When writing a text, it could be argued that you can focus on your own ideas. Readers can move around a text, go to the part that interests them, that answers a question they have. However, the audience has to follow your presentation from beginning to end, they have no remote control to skip ahead or rewind. And people are generally only interested in things that can be of use to them. How many times has someone told you about a new app or software that they are using and which they find extremely useful? They talk to you at length about it, even show it to you and give you a demo. And maybe you are interested in it at the time. And you think, I should try that app out. It could be useful. But you never do. You forget all about it. Why? Because your friend has explained how the app has solved a problem for them. They haven’t (perhaps) thought about what problems or needs you have and how that app could be of benefit to you. If you want to make an impactful presentation, you need to think how you can help solve a problem, an important pressing problem, that the audience has. So, you are not the Karate Kid, you are not the hero of the presentation, even though it feels like that with everyone looking and listening to you as you stand on stage. 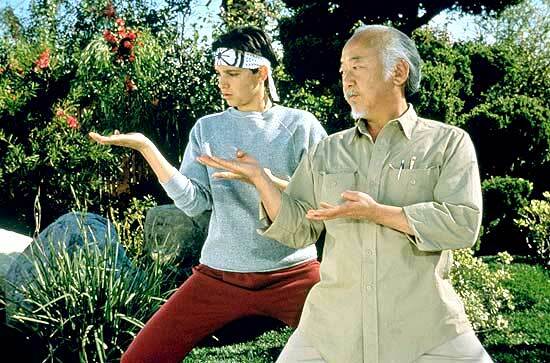 If you are not the Karate Kid, then who are you? You are Mr Miyagi. Granted, not so young, good looking or exciting, but a key figure nonetheless. You are the mentor to the hero. You help the hero overcome a problem they have. Your audience is the hero of your presentation, not you. You are the mentor and your role is to help them, guide them, offer them a convincing solution to a specific problem they have. 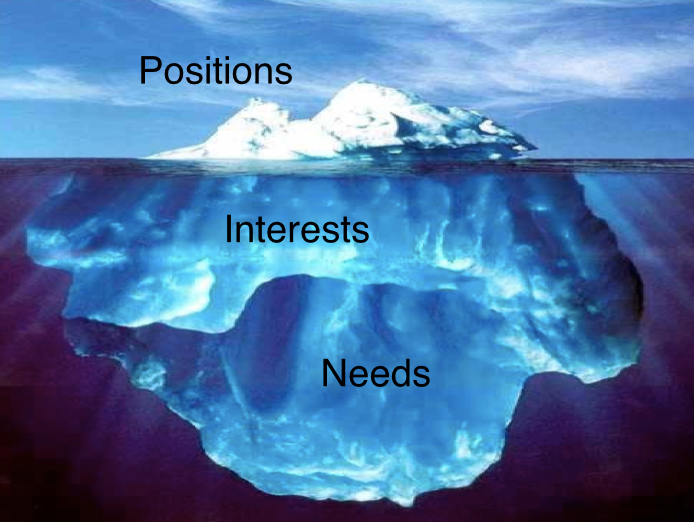 If you start your presentation talking about them and their needs they will give you the utmost attention. So, don’t start your presentation by immediately launching into how much experience you have and your authority to speak on this subject (which is how 99% of presentations begin). Instead, begin first by grabbing their attention, then outline the Big Question (their problem) that you are going to speak about and only THEN establish your authority to talk about this question/problem. After you’ve established your authority, tell them what your argument is i.e. the answer you are going to propose to that question. If you see the audience as the most important thing in your presentation you will also be less nervous and more enthusiastic. Your focus will be on them, on helping them. It is much easier to get enthusiastic about solving someone else’s problem than it is to speak about your own ideas, which can be egotistical. Also, it is unfeasible to use a presentation to speak about your ideas on a topic. Why? Because as a (presumed) expert on the topic, you should have many, many things to say about it, far too many to fit them all into a 15 minute presentation. How do you choose what to say? Should you choose the things you deem most important? The things that are easiest to explain in 15 minutes? The things that are the most visual to stick in a PowerPoint? No, tell them the things they need to know in order to solve their specific problem. If we all approached our presentations, meetings, classes this way we’d save a lot of time and leave our heroes champions of the Karate competition every time. There are a few key things to keep in mind when you are making a presentation to a hostile audience. A hostile audience is one that you know is not in agreement with the main argument of your presentation. They may not even agree that the problem you are addressing is in fact a problem. Firstly, research has shown (see New Yorker article) that people’s beliefs are weakly related to their political affiliations and more to do with self-identity. Thus, when you area in the important phase of preparing your presentation, which necessarily invokes researching your audience, don’t just investigate their stated positions on the topic. These “positions” are like political affiliations. They are what we like to tell ourselves and our friends. However, much more important are the beliefs and needs of the audience. It is by addressing these beliefs and needs of our hostile audience that we will increase our success of persuading them. However, be aware of the practical limitations you have to work within. If you are addressing a deep-rooted problem, the audience is hostile and you have only been given 15 minutes to speak to them don’t set your hopes high that you will have changed their mind by the time the Q&A session is over. What you can at least aim for is to plant a seed of doubt in their minds. A doubt that will impel them to contact you for more information, or research the matter further for themselves, or soften their hardened rhetoric on the matter. A practical word of advice on how to structure a presentation to a hostile audience – you should aim to spend the first half of your talk (at least) outlining the position of your audience before starting to outline your own position. Work hard on this part in your preparation, as it will be the hardest part. It is always difficult for us to put ourselves in the shoes of our opponent. And be careful of making an easy target at which take aim – of simplifying your opponent’s position. Explain their position so precisely, forcefully and succinctly that they themselves wished they had explained their position in those words. And if possible, tell them whose ideas you are referring to, name their heroes and do justice to their ideas. It is only once the hostile audience feels that you fully understand their position that you can go about offering a different point of view. 1. You should attempt to re-express your target’s position so clearly, vividly, and fairly that your target says, “Thanks, I wish I’d thought of putting it that way. 2. You should list any points of agreement (especially if they are not matters of general or widespread agreement). 3. You should mention anything you have learned from your target. 4. Only then are you permitted to say so much as a word of rebuttal or criticism. -Cómo valorarías el nivel de inglés de los científicos españoles? El nivel de inglés normalmente se mide según las capacidades para el habla, la comprensión, la lectura y la escritura. En mi experiencia, el nivel de inglés escrito y leído de la mayoría de los científicos españoles es bastante alto, ya que la investigación de mayor impacto está publicada en inglés. Además, en el día a día, muchos científicos se comunican con colegas internacionales por email en inglés. Sin embargo,¡ no les gusta coger el teléfono si estos mismos colegas les llaman! Hablar y entender es mas difícil que escribir y leer, ya que uno tiene que hacerlo en el momento -no hay tiempo para utilizar un traductor de Google-, hay muchas variedades de acentos, y además, por teléfono es aún peor porque este medio no permite el lenguaje corporal. Otro problema es que, tradicionalmente, las clases de inglés en España se han basados en leer y escribir. Por qué crees que es una de sus necesidades de formación más demandadas? En Europa en general muchos profesionales piden formación en comunicación oral por dos razones. Primero, porque es una de las competencias más importantes en el ámbito laboral, aunque no ha estado muy de moda dar este tipo de formación durante muchos años. Es particularmente importante en el campo de la ciencia, donde hay dos partes claves del trabajo de científico: hacer la investigación y comunicar los resultados. La comunicación en ciencia se hace a través de publicaciones y de comunicaciones orales. En un mundo lleno de información -gracias a Internet y las nuevas tecnologías- y con más y más investigadores trabajando en campos cada vez más estrechos, el contacto personal que permiten las presentaciones orales tiene un papel aún más importante. Segundo, porque desgraciadamente, no hay mucha formación en escritura o en buena expresión oral. Y es igual en las universidades. Sin embargo, en los EEUU, los estudiantes reciben mucha formación en los dos aspectos, y creo que de esto se dan cuenta los científicos españoles cuando ven presentaciones hechas por sus colegas americanos en los congresos internacionales. Mi hermano es profesor de comunicaciones en los EEUU y es impresionante la formación que reciben los estudiantes jóvenes sobre hablar en público, y no sólo sobre escritura. A qué crees que se debe la fobia generalizada a las presentaciones orales en inglés? A muchos factores, y para cada persona es diferente. Muchas veces, creo que la gente tiene miedo de hablar en público y se fijan en el problema de la lengua porque parece una excusa más tangible o un problema que no es culpa suya. En mi experiencia, el problema (que llega a convertirse en una fobia) es que mucha gente no tiene muy claro o bien pensando lo que quiere decir. Cuando es así, es verdad que es mas fácil hablar sin decir nada cuando es en tu legua materna. Lo malo (pero para mi lo bueno) de hablar en otra lengua es que te hace pensar bien sobre lo que realmente quieres decir. Otra razón que he oído muchas veces es que la gente tiene miedo de que se le pregunte algo y no entiendan la pregunta. La presentación, más o menos, está baja tu control hasta que llega el momento para las preguntas. Es entonces cuando hay que improvisar y rezar que el público no esté lleno de escoceses curiosos con muchas preguntas (¡porque tienen un acento difícil de entender!). Pero hay muchas estrategias para manejarlo y sentirse mas cómodo en la “Q&A” (preguntas y respuestas) y hablamos de esto en el curso. Finalmente, hay personas que tienen miedo de hablar en público porque no creen en el proyecto que tienen que presentar. Bien porque se sienten forzados a hacerlo porque su jefe se lo ha pedido, o porque aún no han resuelto sus dudas, etc. No se puede ayudar a estas personas. Es imposible hablar con confianza sobre algo en lo que no crees (¡bueno, quizás algunos políticos sí que pueden hacerlo!). Qué pesa más, la barrera del idioma o la falta de autoestima? Cuando tienes un nivel mínimo, el idioma no es para nada una barrera. La falta de autoestima es un término que cubre una multitud de factores, y yo no soy suficientemente experto para hablar de ella. De lo que sí puedo hablar es de ejercicios y consejos muy prácticos y simples que cualquiera puede hacer para prepararse mejor, sentirse más cómodo y dar una presentación efectiva. ¿Qué es un nivel mínimo? Para mí, esto significa que puedes explicar en una conversación en inglés con alguien qué haces en tu trabajo, responder a sus preguntas y preguntarle a su vez. Lo importante no es que esta conversación sea gramáticamente perfecta, o sin pequeños errores, sino que sea suficiente fluida, interesante y divertida para que las dos personas se fijen más en el contenido que en la dificultad de comunicarse en inglés. En mi experiencia, una falta de autoestima antes de hablar en público normalmente tiene que ver con el miedo y con no tener bien pensado lo que quieres decir. El miedo disminuye con la preparación. Para saber lo que quieres o debes decir, tienes que preguntarte “¿Quién es mi público? ¿Cuál es su problema? ¿Cuál es mi solución? ¿Qué quiero que mi público haga después de escuchar mi solución? ¿Cuánto tiempo tengo para hablar con ellos? Cuáles son los errores más comunes en las presentaciones científicas en inglés de los españoles? 1. Matar al público con el PowerPoint. Eso significa poner un montón de texto en los diapositivas. La gente lo hace pensando que con mucho texto parecen más serios, que han hecho mucho trabajo o que el contenido es más fácil de entender si el público puede escuchar y leer a la vez. 2. Presentar un “paper” en vez de una presentación. “Papers” y presentaciones son dos medios diferentes, cada uno con sus ventajas y desventajas. Pero muchos científicos piensan que es posible comprimir todo su trabajo durante 5 años en una presentación de 10 minutos. 3. Presentar datos sin ningún argumento. Hay quien piensa que es mejor sólo presentar datos y dejar al público llegar a sus propias conclusiones sobre el significado o importancia de estos datos. Quizás esto es posible en un texto, pero la gente se agobia o se aburre en las presentaciones que no proponen ningún argumento. 4. No se da tiempo para las preguntas. Las preguntas del público al final (o durante) una presentación son muy importantes. De hecho, en mi opinión forman la razón principal para organizar una presentación o un congreso. Es una oportunidad para el público de preguntar en persona al científico, y es una oportunidad para el científico de comprobar que el público ha entendido la charla, así como probar sus ideas frente a las ideas de lo demás y ver si hay que mejorar o reforzar alguna parte de su investigación. 5. El científico, como persona, se esconde. Uno de los aspectos más importantes de las presentaciones orales y congresos es la oportunidad que se les ofrece para conocer personas y grupos, sus pasiones y desafíos como individuos, detrás de la ciencia. Sin embargo, muchos presentadores no dejan sus personalidades ni su sentido del humor “escapar” durante sus charlas, y por eso muchos presentadores parecen aburridos y fríos. En qué medida puede ayudar el nuevo curso How to improve your scientific presentations? El curso es una oportunidad para explorar y ver varias maneras de dar presentaciones de una manera relajada, divertida y honesta. Aporta consejos, ejercicios y modelos para dar presentaciones en muchos contextos. No hay profesores ni estudiantes, todos los participantes en el curso, incluído yo, aprendemos uno del otro dando feedback y contando nuestros experiencias. El curso es una mezcla entre clases, discusión, ejercicios prácticos, y tiempo para preparar una presentación de 4 minutos que cada uno de los participantes hará al final del curso. En concreto, el curso propone un sistema muy adaptable y fácil de aplicar en la preparación, diseño y presentación de una charla. Empezamos hablando de las diferencias entre “papers” y charlas, y de cómo podemos adaptar un material en texto para una presentación oral. Cuando sabes de qué quieres hablar, hay que identificar tres cosas fundamentales: cuál es el problema que tiene el público, cuál es tu solución, y qué quieres que ellos hagan si están de acuerdo con tu argumento. Después de concretar estas 3 bases fundamentales, presento una estructura que es aplicable a casi todas las presentaciones. He diseñado una plantilla en pdf interactivo que se puede utilizar para estructurar y escribir la charla. Se puede descargar el pdf gratis desde mi página web www.elucidate.es. Cuando tienes la estructura hecha y el texto de la charla escrito, ya es el momento para abrir el PowerPoint y diseñar las diapositivas. En el curso exploramos qué es un buen diseño y aporto consejos para fotos, vídeos, texto y animaciones. Los participantes reciben una segunda plantilla de PowerPoint muy sencilla pero atractiva que puede utilizarse para diseñar sus diapositivas. Cuando el contenido y el material de la charla están preparados, fijamos la atención en el presentador. Contando con mi experiencia como director de teatro, exploramos de una manera divertida, relajada y con el apoyo de todo el grupo, el lenguaje corporal, la voz y la mirada. Cada participante hace ejercicios individuales que se graban en vídeo y posteriormente reciben feedback sobre su estilo personal. Al final del curso, cada participante hace su presentación de 4 minutos en la que han estado trabajando durante el curso, incorporando los consejos y herramientas nuevos. Finalmente, el curso no acaba tras estos dos días. También tiene una parte online. Realizo una wiki (página web en la que todos los usuarios pueden subir material) privada, accesible solamente a los participantes del taller. En la wiki, se pueden ver dos vídeos personalizados, uno en el que se pueden ver los ejercicios de cada participante y un feedback sobre su lenguaje corporal y voz, y otro vídeo de su presentación al final del curso con el feedback del grupo. Además, en la wiki se pueden ver todas las clases impartidas por mi parte, descargar todos los materiales del curso (el PowerPoint que utilizo yo, las apuntes de cada módulo, las plantillas, etc…), páginas webs interesantes y e-books sobre presentaciones gratuitos. Cuál está siendo la respuesta de los alumnos? Es muy importante para mí y para la Fundación Esteve tener datos sobre la valoración del curso. De esta manera podemos saber objetivamente si el curso cubre las necesidades de los participantes y también pedir opiniones sobre maneras de mejorarlo. Por eso hacemos encuestas después de cada curso, y a través de la wiki recibo más feedback por email un mes después de que acabe el taller. El curso ha tenido mucho éxito. Los datos y el feedback muestra claramente que es muy útil para científicos. Les ha gustado el contenido, los consejos, las herramientas y la forma de enseñanza y participación. I’ll be doing one-day workshop in communications skills at Médicos Sin Fronteras, Barcelona, for the new medical coordinators and heads of mission going abroad on their first mission. Communications skills are crucial in crisis situations and I hope to run a rewarding course for all those preparing for their important work. I’ll be running a workshop at UB on July 10th 2013 on how to make effective presentations in science.